After telling you all about my girls trip to Napa (days 1, 2, and 3), life at home got busy and I never got a chance to tell you about the last day of our vacation. So, that's where we are picking up and ending things today: better late than never, right? And the last day of our vacation was spent in beautiful San Francisco. We headed into the city on Sunday evening with a flight out Monday night, giving us a dinner and most of a day to enjoy the city. 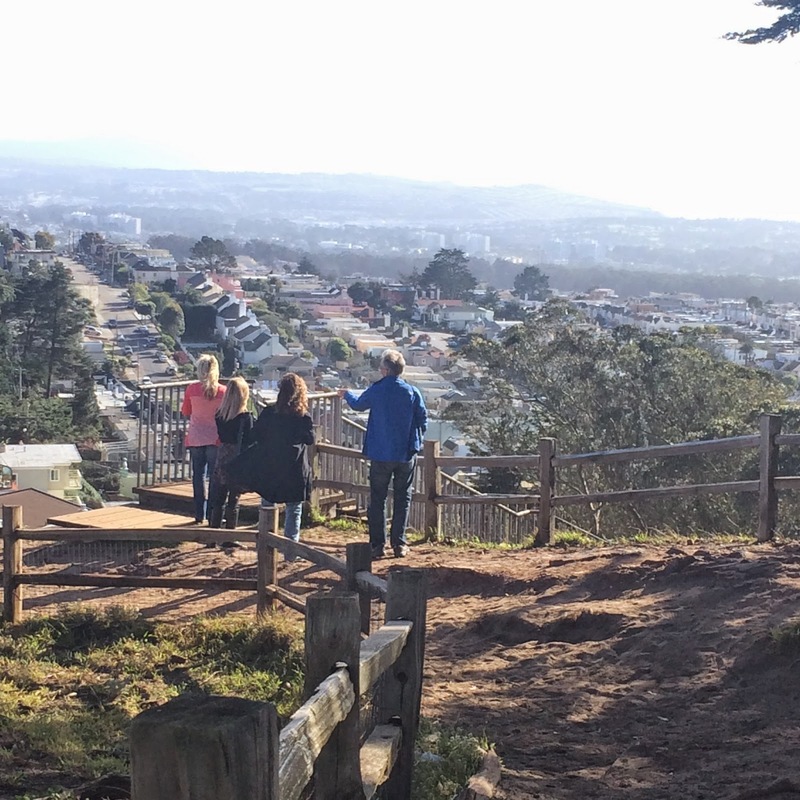 It was the first visit to San Fran for my sister and me and the first in decades for my mom, so we had a lot of ground to cover. Lucky for us, my Uncle Jack has lived in the Bay Area for some time now and gave us a whirlwind tour of the city during our short visit. While Uncle Jack planned most of the trip itinerary, I did get to make a few requests when it came to dining. And in a city like San Francisco with so many amazing options it was impossible to select a place to eat. 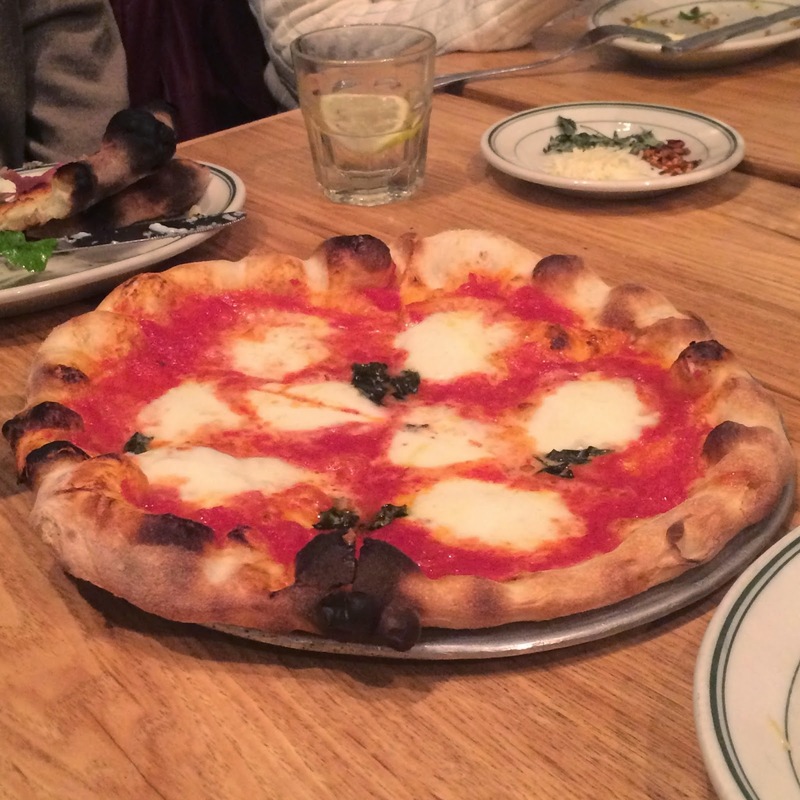 After coming up with a list and running it by my mom though, we settled on Pizzeria Delfina-- and it was the perfect place for a casual meal with family. Pizzeria Delfina is an awesome little pizza joint in the Pacific Heights neighborhood (with another location in the city's Mission area). And clearly the rest of the city agrees is amazing because even on a Sunday evening there was a wait out the door to get seated at this little place. My uncle was able to put our name in earlier in the day-- not technically a reservation, but it definitely expedited the process-- so we were seated after waiting for only about 10 minutes. The food here is an eclectic mash up of traditional Italian dishes with creative food trends and ingredients. Going with a big group meant we got to sample a few things here, which is one of my favorite ways to dine at a new spot! We began the meal sharing a few salads-- one was a simple tricolore salad of arugula, radicchio, and endive with a light lemony vinaigrette and shaved grana padano. The simple fresh flavors were delicious, but I didn't get to snap a picture of that one for you. The second salad was quite a bit more complex, but really interesting and tasty. 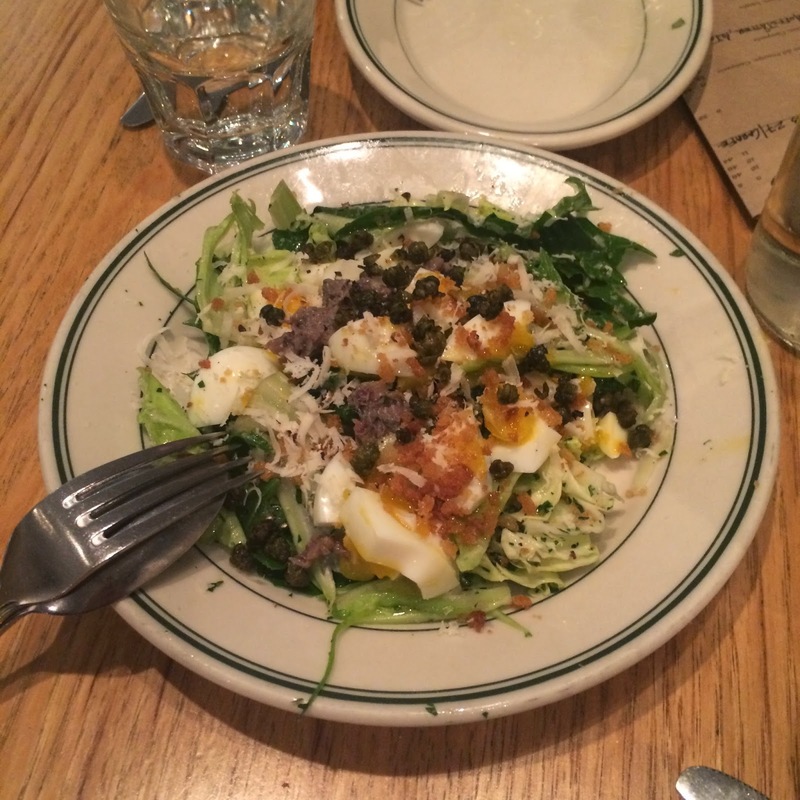 The Italian chopped salad was a special that day and consisted of greens topped with a chopped soft boiled egg, toasted bread crumbs, crispy capers, with a light and tangy dressing. I'm not usually a fan of eggs in my salad (because they are usually hard boiled, which is one of this food blogger's food pet peeves), but these were soft boiled and the slightly runny yolk really added some delicious richness to this salad. We also sampled the burrata, one of my 'go to' items to order. This deliciously creamy cheese was served in a very traditional Italian-style: with lightly dressed lemony arugula, toasted crostini, and a drizzle of olive oil. Simple and tasty. Now, let's talk about pizza-- because that's why we really came here. The pizzas at Pizzeria Delfina are a perfect size to share one pie between you and a guest, or maybe one for you to eat and take home enough for dinner tomorrow. For our table of 6, we ordered 3 pies in addition to those starters and it worked out perfectly. They're New York and Neopolitan-inspired, so the crust is thiny, chewy, and crispy on the edges and the slices are generous. The first was a simple margherita: a light layer of pureed tomato, a generous amount of fresh mozzarella, and a touch of basil. This is a great standard pizza option to order as a complement to some of Delfina's more imaginative pizzas. Delfina's Prosciutto Pie is one of my favorite traditional (Italian, not American) pizzas and their version lived up to my expectations. A crispy chewy crust topped with a thin layer of creamy sauce, melty caciocavallo cheese (similar to a provolone), thick slices of prosciutto di Parma and then fired. After baking, it is topped with a generous portion of lightly dressed arugula. I love the combination of flavors and textures here: Warm, chewy, salty, and rich pizza topped with the fresh crunch of arugula that has that great acidic and peppery bite to it. Pizza perfection. Probably the biggest hit of all 3 pizzas that night was another special that evening: a Carbonara Pie inspired by its pasta namesake. This white pizza had a rich creamy white sauce base which got a punch of flavor from a generous topping of pecorino romano cheese. That was topped with fresh green onion, and salty guanciale (a bacon-like cured pork cheek). The pizza was finished with a raw egg cracked in the center, which cooks until just set in the firing process so that the yolk is runny and delicious when the pizza is sliced. I'm not a huge carbonara fan, but this pizza was something really special. 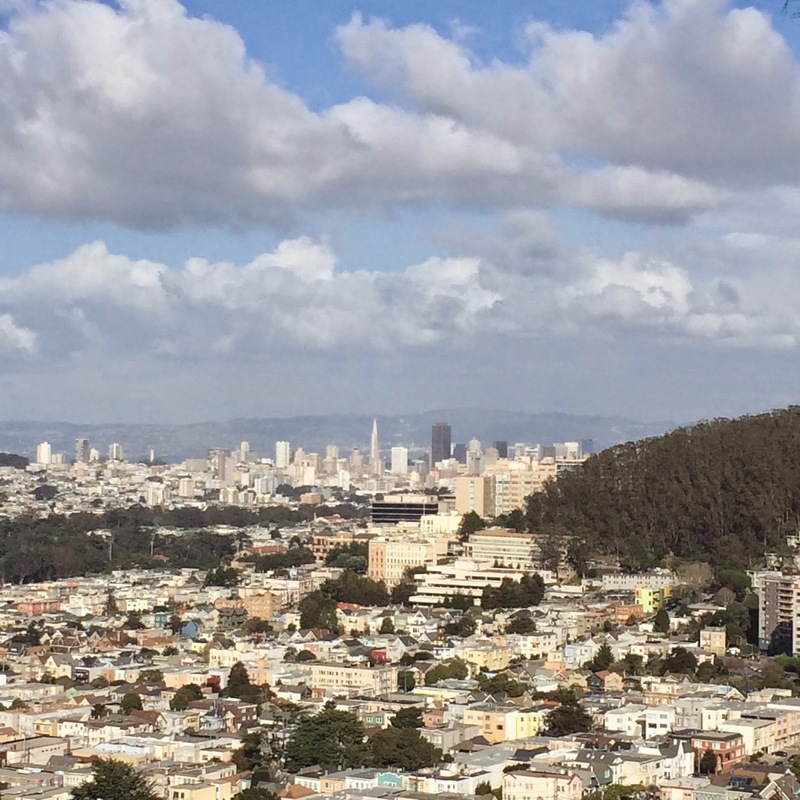 We got lucky and had some great weather in San Francisco. 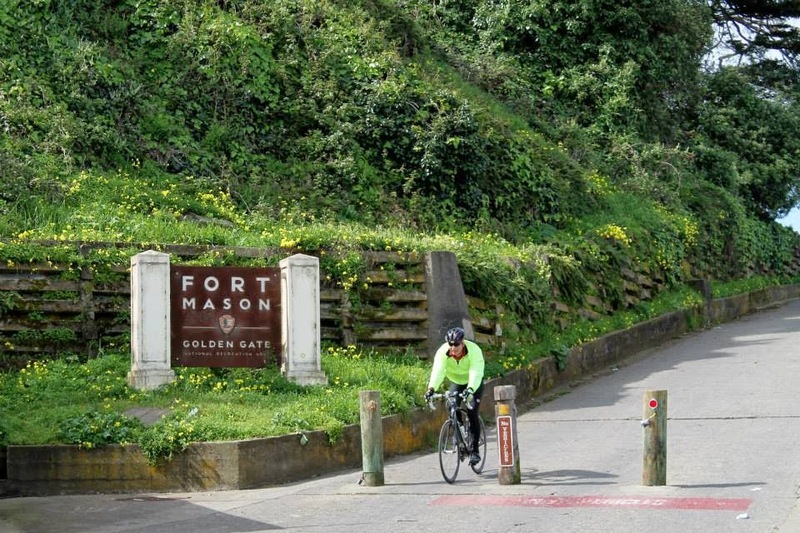 It was sunny and brisk and perfect for exploring the city-- especially walking around the waterfront area: first, a walk up the hill and out on to the pier near Fort Mason. 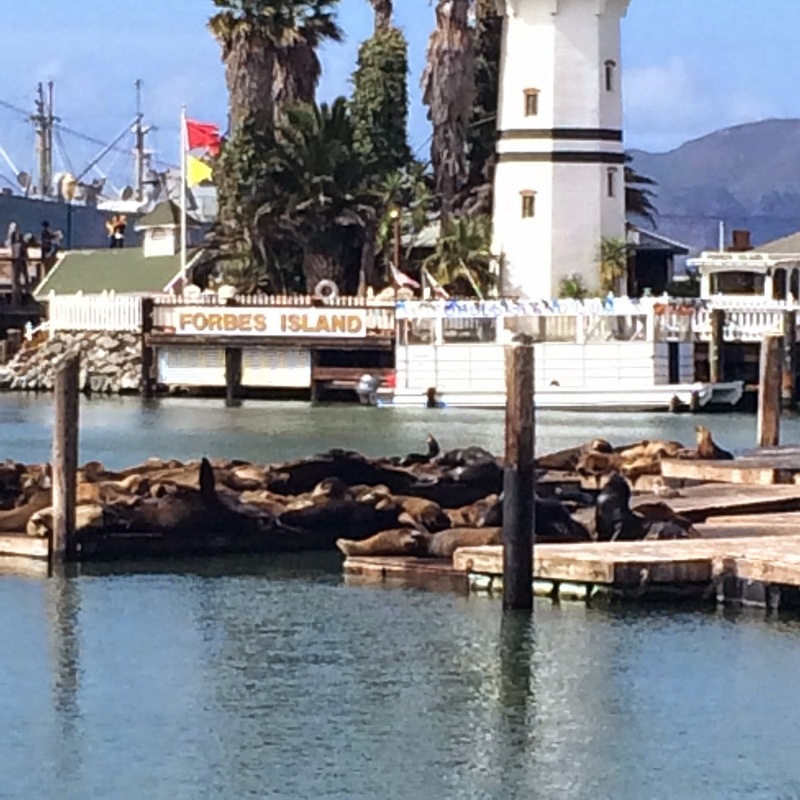 And the a visit to the famous Pier 39. I know it's totally cliche and touristy and San Franciscans probably feel the same way about this area that I feel about Navy Pier in Chicago, but we really wanted to see the seals. And they delivered! 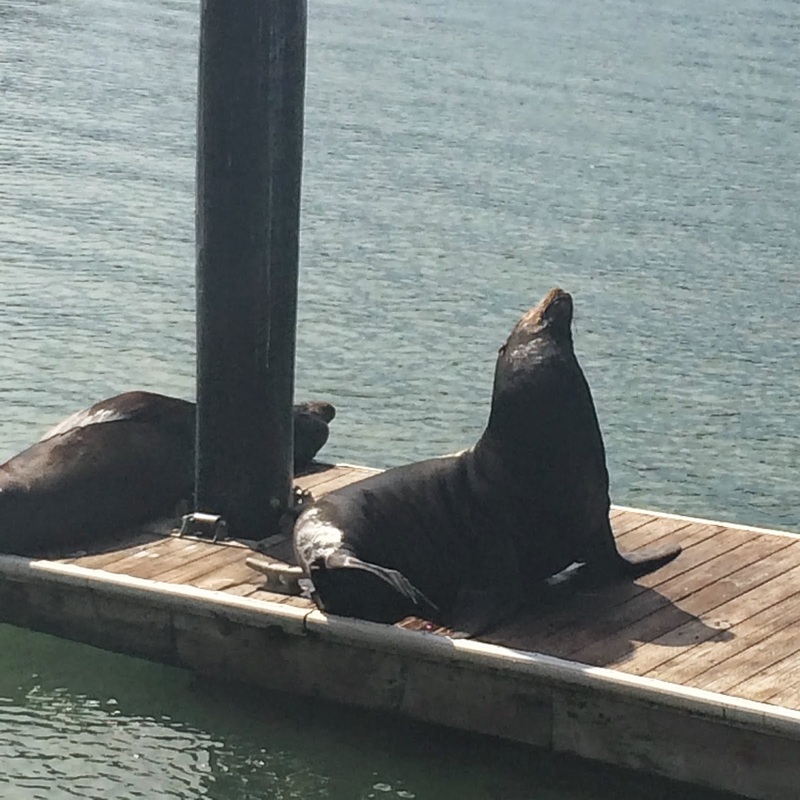 That day's sunshine had all the seals out basking in it-- including two that were seeking a little privacy and found a dock very near to where we were watching them from to sun themselves separately. Uncle Jack was very good about indulging our San Francisco tourist requests: seeing the seals, the Full House house (read on), and this foodie wanted to have some legit dim sum. 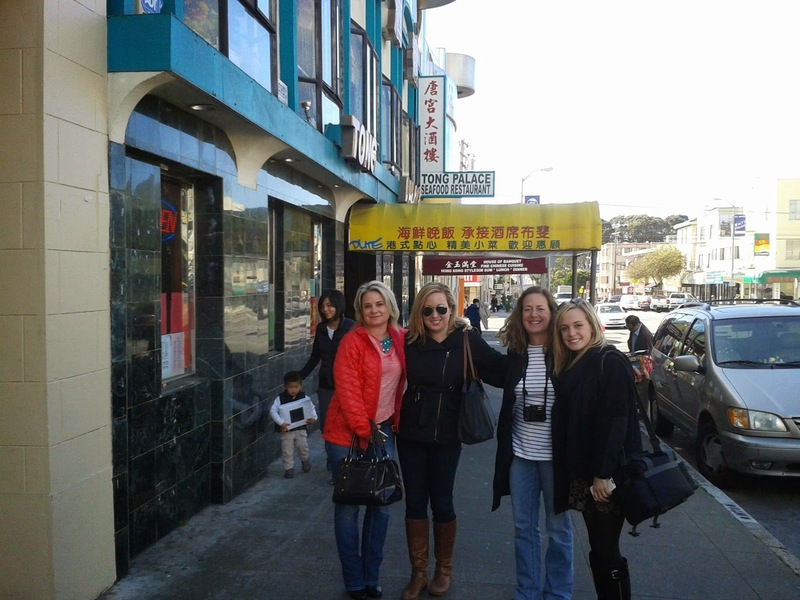 With the exception of the Chinatown neighborhood, dim sum is hard to come by in Chicago so I knew that a trip to San Fran was our opportunity to try the real deal. Not knowing where to begin in selecting a dim sum restaurant, we asked Uncle Jack to take us to his favorite spot and we ended up at Tong Palace in the inner Richmond neighborhood. Pretty much as soon as we sat down, the dim sum carts began wheeling by. Since Jack has been here several times, he knew exactly what to order for us-- and we enjoyed quite the variety of dim sum delicacies here. Among the favorites at the table: the baked BBQ pork buns, steamed shrimp & chive dumplings, and the delicious turnip cake (lo baak gou) that had a very savory potato latke-like quality that made it pretty irresistible. After lunch we headed over to the famous Alamo Square Park, home of the Painted Ladies (a strip of architecturally significant Victorian homes) and also the setting for the opening of one of my favorite childhood TV shows Full House. 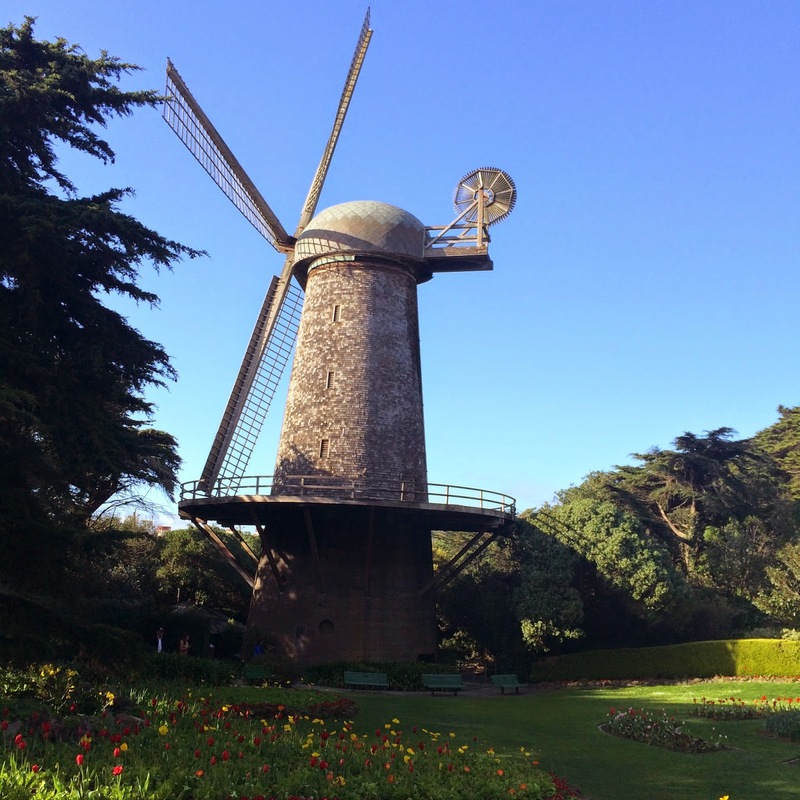 Then we made our way over to Golden Gate Park to check out one of the famous Dutch windmills. It's been there since the early 1900's and is surrounded by a garden of thousands of gorgeous tulips. 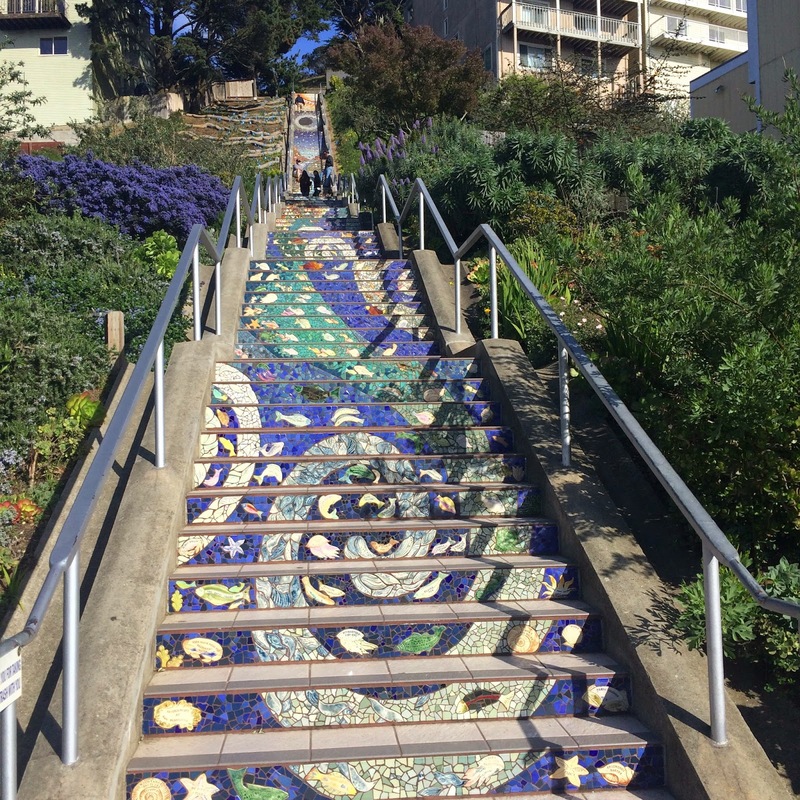 Then Uncle Jack took us to the Golden Gate Heights neighborhood to check out the 16th Avenue tiled steps-- one of the coolest tourist attractions I have seen. Each step is tiled with a sliver of the mosaic so that when you gaze upward, they come together to create one scene. 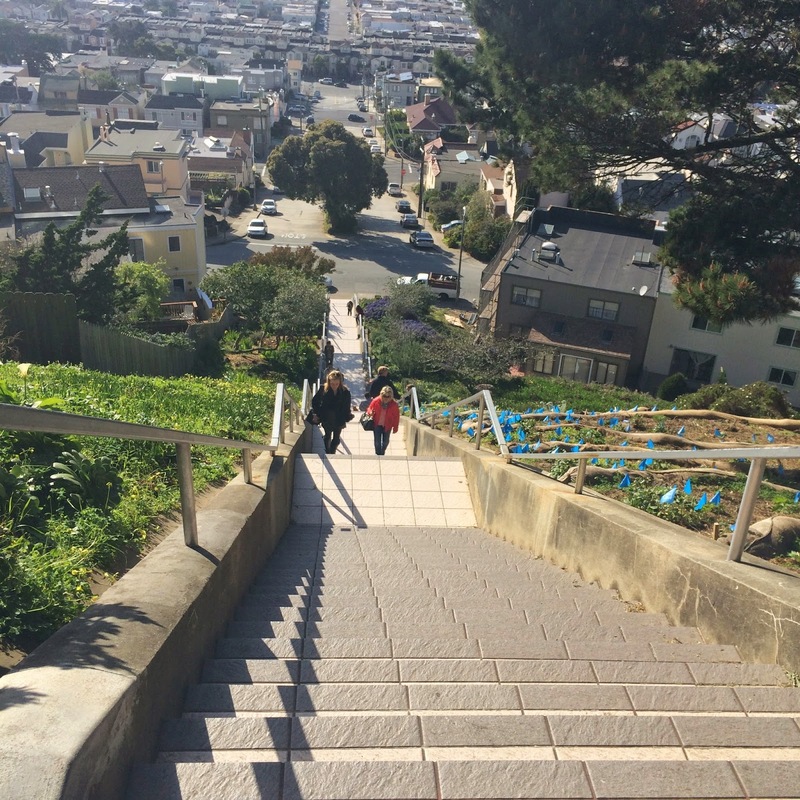 These steps go waaaaay up. And we walked all of them. Working off that dim sum, for sure. But once we arrived at the top, it was clear why we did it! The views from up here are something else and you can see right to the edges of the city and beyond. And last but not least, we ended the day and our trip with more amazing views: from the Presidio with the Golden Gate Bridge in the background. 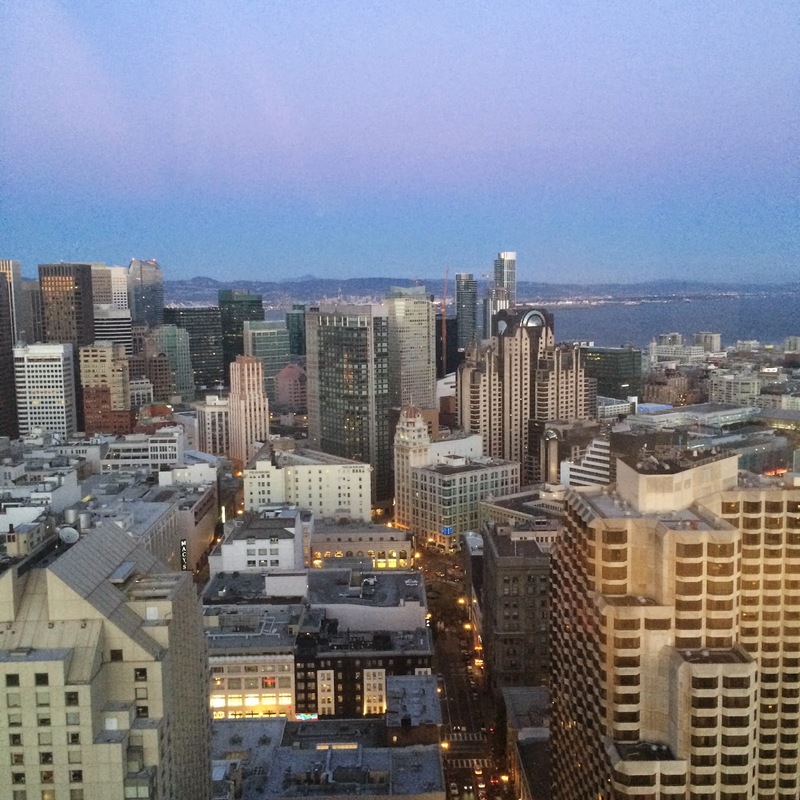 A gorgeous end to a busy, but wonderful day in the city by the Bay. Can you believe that Easter is just around the corner? I feel like it seemed so far away and suddenly just crept up on me without warning this year! For the past few Easters, my sister has been here with us or I was busy prepping to take off for a trip the day after. This year, it's just me, Alex, and a comfortable brunch at home. And I'm thinking that some fancy French Toast would be the perfect thing to serve! 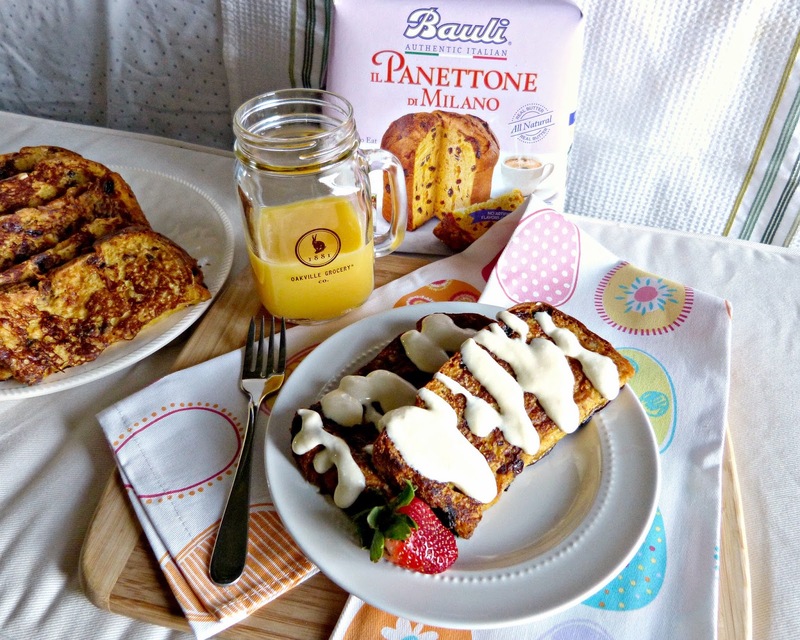 To make this French Toast a little more special and Easter-appropriate, I'm using Bauli Panettone as the base for this delicious meal. Panettone is a traditional Italian treat served at holiday gatherings. They're packaged in pretty boxes (perfect for gifting to a hostess) and you'll often see them stacked up high at Italian markets around the holidays. If you've never had it before, I would say that panettone is like a mashup of an angel food cake and raisin bread. Loaves are traditionally baked into a tall cylindrical shape and the inside is studded with candied citrus zest and raisins. It's not super sweet in flavor, so it makes the perfect base for French Toast. And this French Toast is really special. The traditional egg mixture is doctored up with a delicious combination of flavors like pure vanilla, spicy cinnamon, orange juice, and a splash of dark rum. And thick slices of the somewhat dense panettone soak up the mixture really nicely. Thick slices are key here: it give the French toast that great crispy on the outside and soft on the inside quality that you're looking for here. 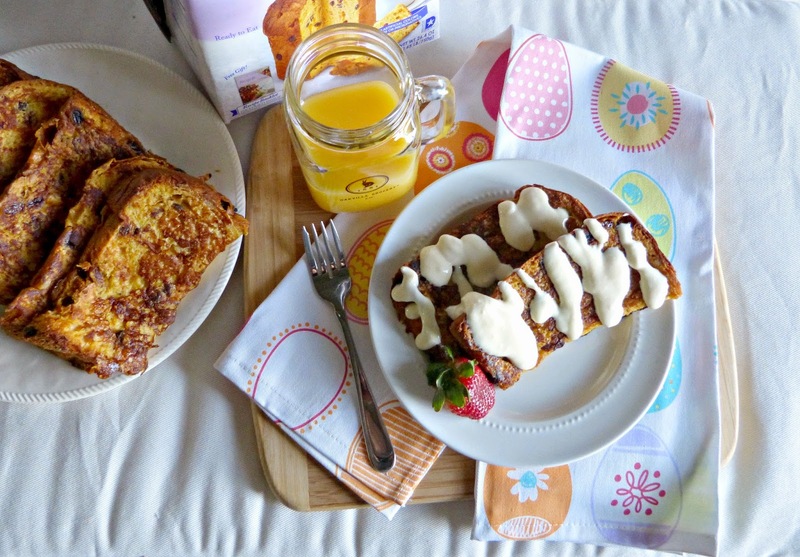 This French toast would be delicious served with maple syrup or with a fresh berry sauce, but I decided to take it up a notch since this is a special occasion recipe. 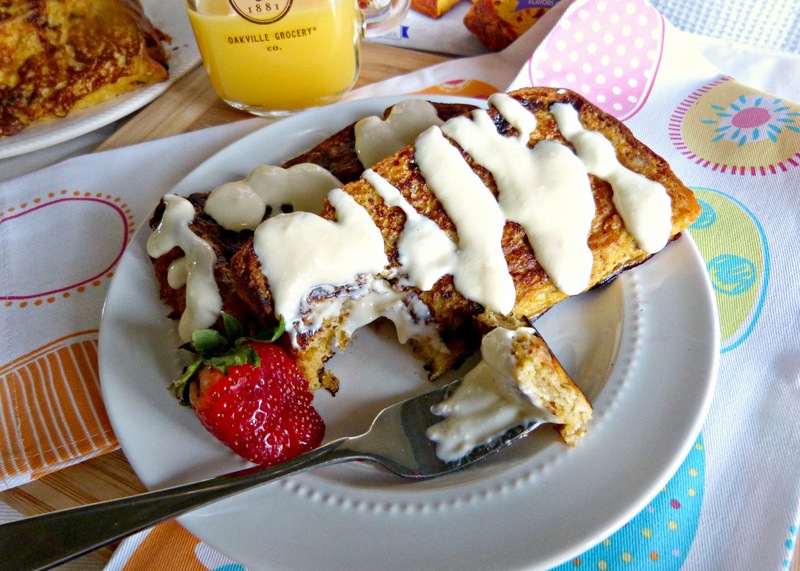 To pick up some of those delicious citrus flavors in the panettone and in the French Toast batter, I topped the warm French Toast with a sweet and tangy orange mascarpone glaze. The fresh orange flavor makes the glaze bright and fresh and rich mascarpone turns this into a really decadent brunch-- and ups the Italian factor of this recipe too! This recipe is perfect to serve to a smaller group (like our little family Easter) or can easily be doubled or tripled with a few loaves of panettone for a crowd. Carefully unwrap the panettone and discard the wrappers. Using a large serrated knife, slice the panettone (from top to bottom) into 3/4-inch slices. Discard the two end slices. Cut the remaining slices down the middle (again, from top to bottom) and select 8 of those slices for the French toast. In a large shallow dish (like a casserole dish or deep dish pie plate), whisk together the eggs, milk, orange juice, rum, vanilla extract, brown sugar, and cinnamon until combined. Heat butter on a griddle or large saute pan over medium heat. Submerge panettone slices in the egg mixture one at time, turning gently to evenly coat both sides. Allow excess egg mixture to drip off the panettone and then add to the pan and cook until the bottom of the slice is golden brown, about 3-5 minutes. Flip each slice and continue to cook until the other side is golden as well. Repeat with remaining slices. Whisk mascarpone, 1/4 cup orange juice, powdered sugar, and orange zest together in a medium bowl until well combined and smooth. At this point, look at the texture and decide if you'd like to add more juice for a thinner glaze. Continue whisking, adding more juice as needed, until desired consistency is achieved. Serve the French toast warm, drizzle glaze over the top, and serve. Editor's Note: Products were provided at no cost in order to facilitate this post. The opinions expressed here, as always, are my own. I don't know about you, but when I thought about the Chicago restaurant Paris Club my mind immediately went to house music, a crowded bar, and a trendy 'seen and be seen' atmosphere. Well, I recently dined there (for the first time!) and am happy to report that I was wrong-- and pleasantly surprised. What I found instead was a romantic and cozy French bistro offering a menu filled with creative versions of classic French dishes. Big comfy banquettes, wood paneling, and understated but luxe details adorned the dining room, which would be an ideal location for a date night, entertaining clients, or dinner with the ladies. As you know, I'm a big fan of Lettuce Entertain You's eclectic portfolio of restaurants and I was happy to check another one off the list that-- yet again-- exceeded my expectations for quality service and great food. 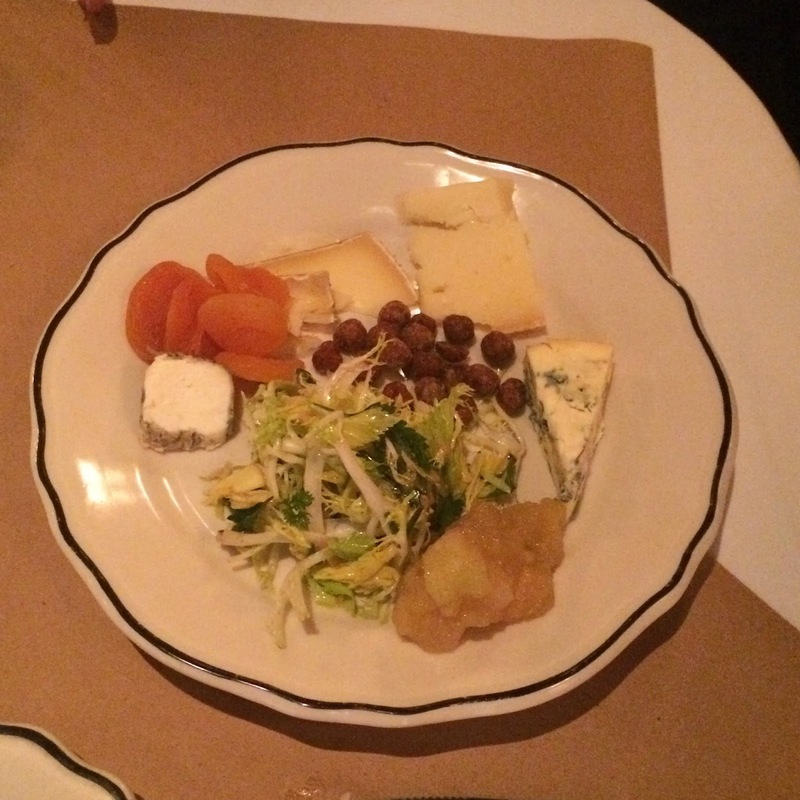 So, let's talk about food-- and service, really-- because the first thing that we enjoyed at Paris Club was a cheese course straight from an old fashioned table side cheese cart. I am a sucker for both cheese and experiential dining, so this was a really fun surprise. The cart had a few different cheese varieties to offer and they were plated with toasted baguette, apple compote, toasted hazelnuts, dried apricots, and a lightly dressed frisée salad. One of my favorite dishes of the night was a simple, but decadent dish that we shared at the table: fluffy scrambled eggs flavored with a hint of truffle and topped with tender lobster. Served with crusty bread, this dish was rich and flavorful and a few of my favorite things on one plate. 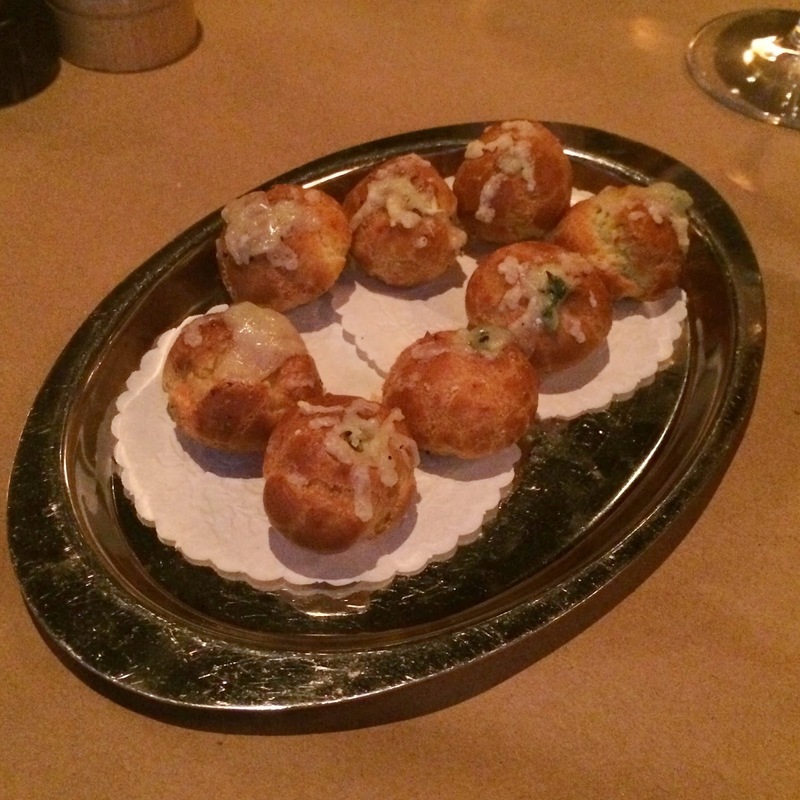 Other starters of note: the delicious little spinach and Gruyere gougeres. These came out as an amuse bouche for the table and they were a perfectly warm and rich way to begin this meal. 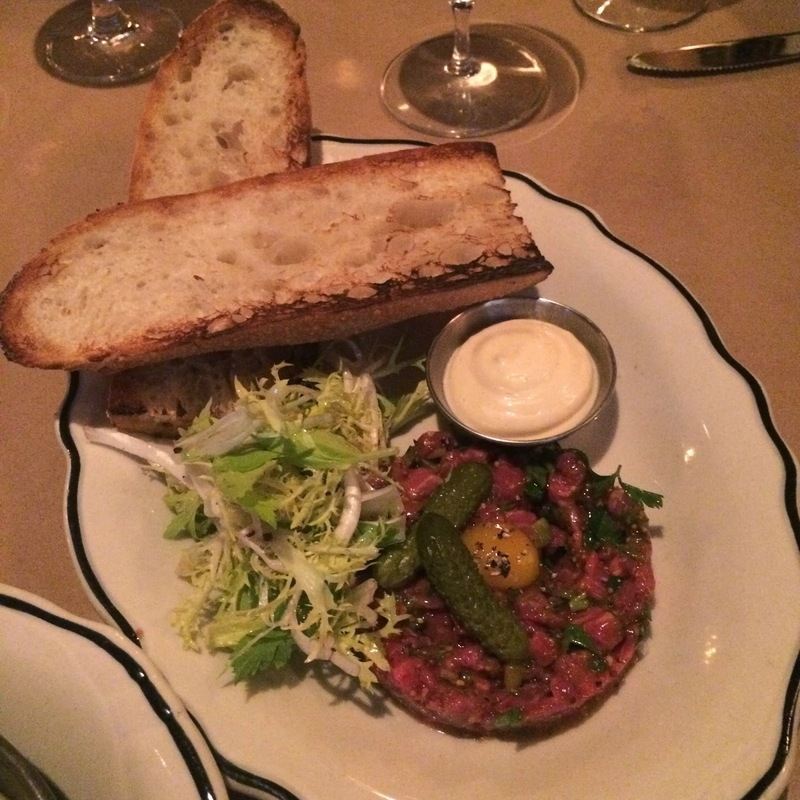 The handcut steak tartare was also lovely. Never one to suggest ordering a raw dish, I'm always happy when someone at my table suggests that we do because I always want to try just a little of it. And the tartare so much more up my alley: cut from tender and lean filet mignon, tossed in quail egg, and served with a deliciously spicy garlic aioli. 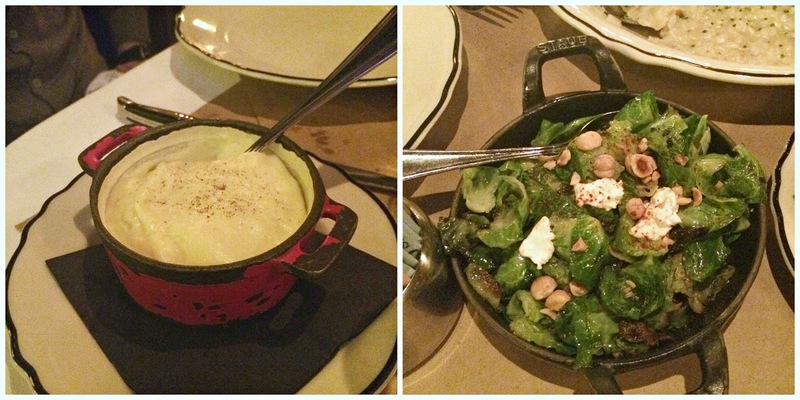 Because so many of the entrees sounded so good, we decided to continue our trend of sharing and split 3 of Paris Club's sizable entrees among the table-- along with a few sides like their amazingly buttery pomme purée and the crispy roasted Brussels sprouts with goat cheese and hazelnuts. 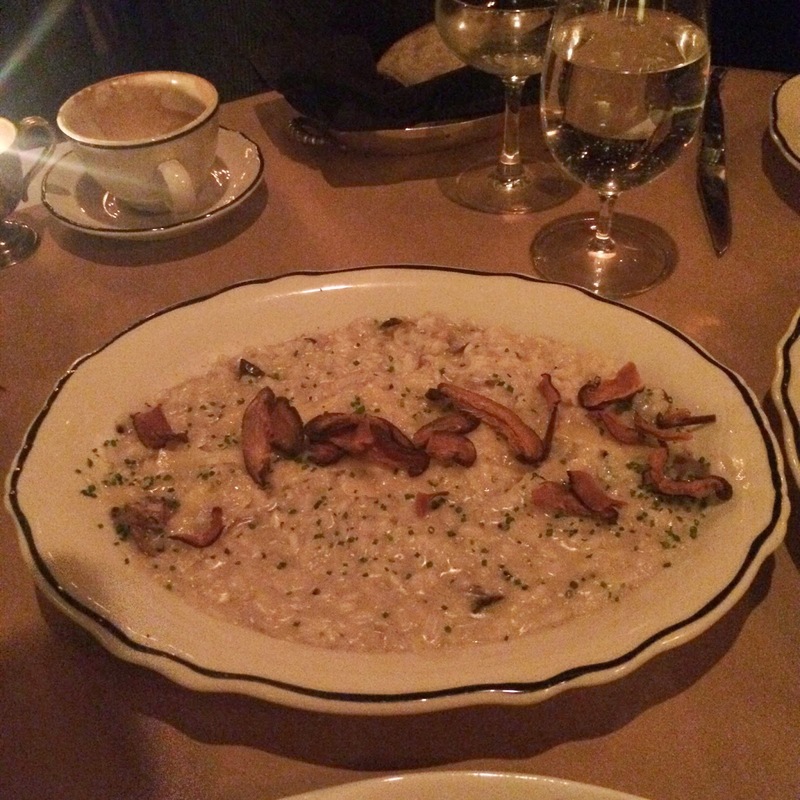 The roasted mushroom risotto was super delicious and a great option for any vegetarian diners. The portion was generous and the risotto was creamy and full of great flavors from the combination of roasted mushrooms and parmesan. 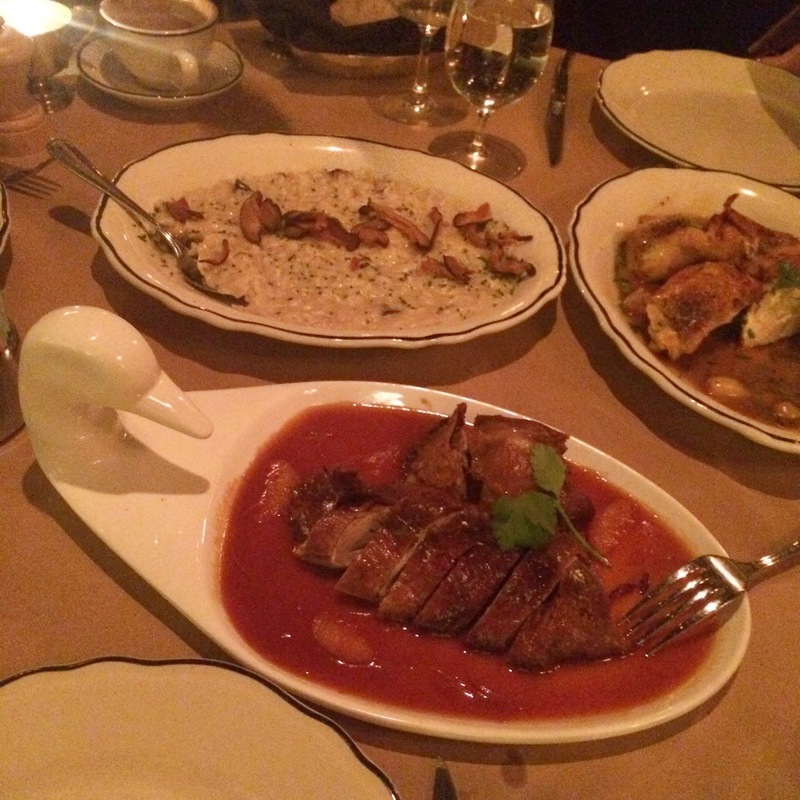 We also shared the crispy duckling, which was served on a charming little duck platter. The duck was perfectly crisp on the outside and tender on the inside, served in an aromatic l'orange sauce that was slightly sweet with just a hint of spice. 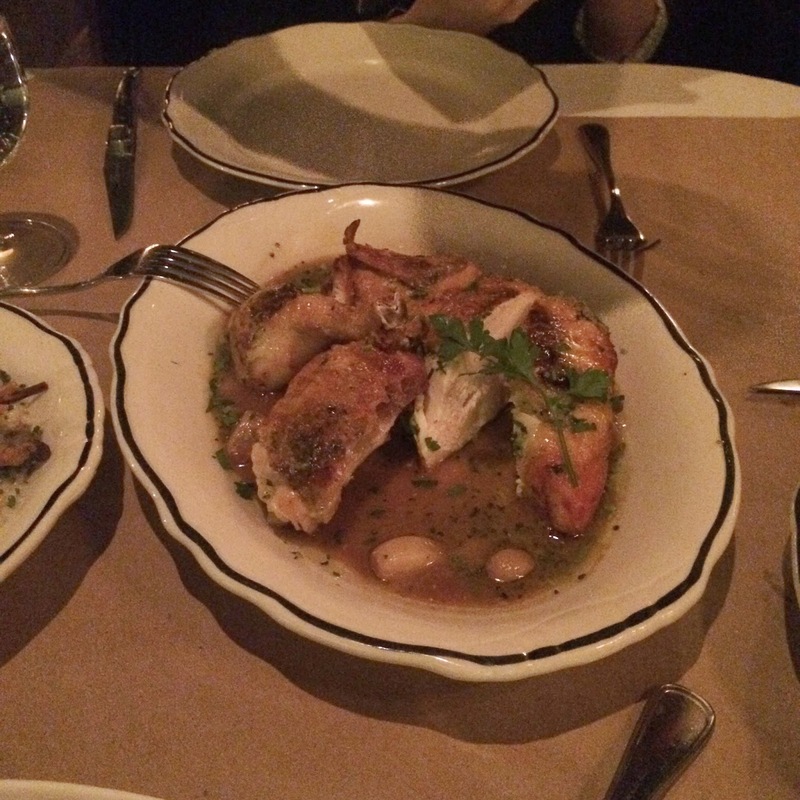 My favorite entree-- and another standout from the entire meal-- was the roasted chicken. A good roasted chicken is hard to come by, but when it's done right there is nothing better. This chicken was really delicious! Crispy skin, tender meat, and a flavorful garlic jus... enjoyed with that pomme puree, it was just the best. This would definitely be on my 'must order' list! And as if that weren't enough food, we ordered dessert. Because dessert. 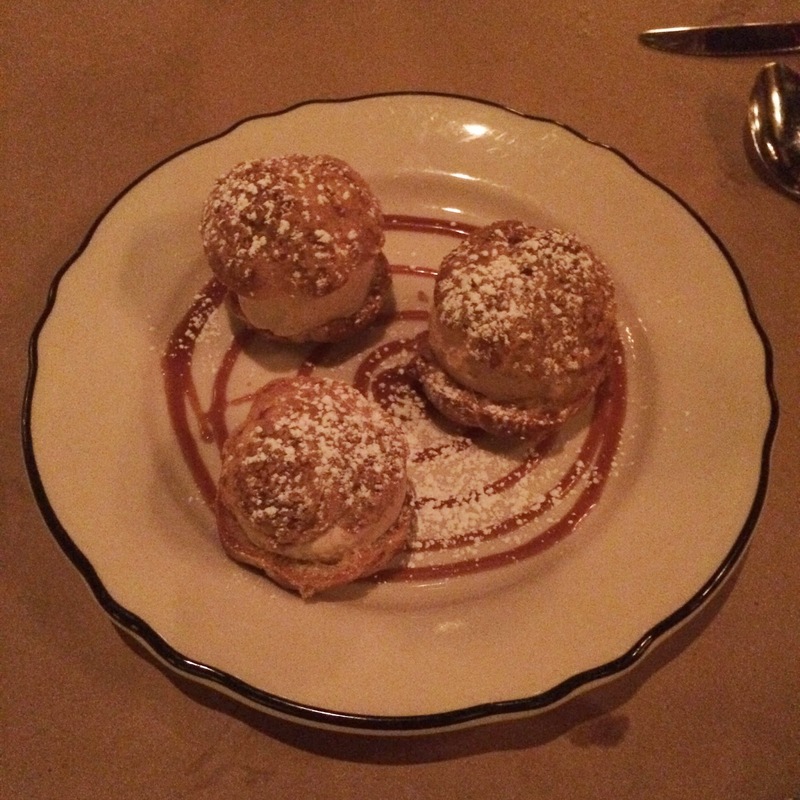 I'm a huge fan of profiteroles and will order them at basically any French restaurant that I go to-- and Paris Club's were some of my all time favorites! Flaky pastry with salted caramel ice cream inside served with delicious caramel sauce and a touch of fleur de sel. They were finished off tableside with a generous drizzle of warm chocolate sauce... just incredible! Also in our dessert spread: something a little fruity! This Meyer lemon tart was sweet, tart, and refreshing with a deliciously crunchy bruleed topping, flaky crust, and a few berries on top. 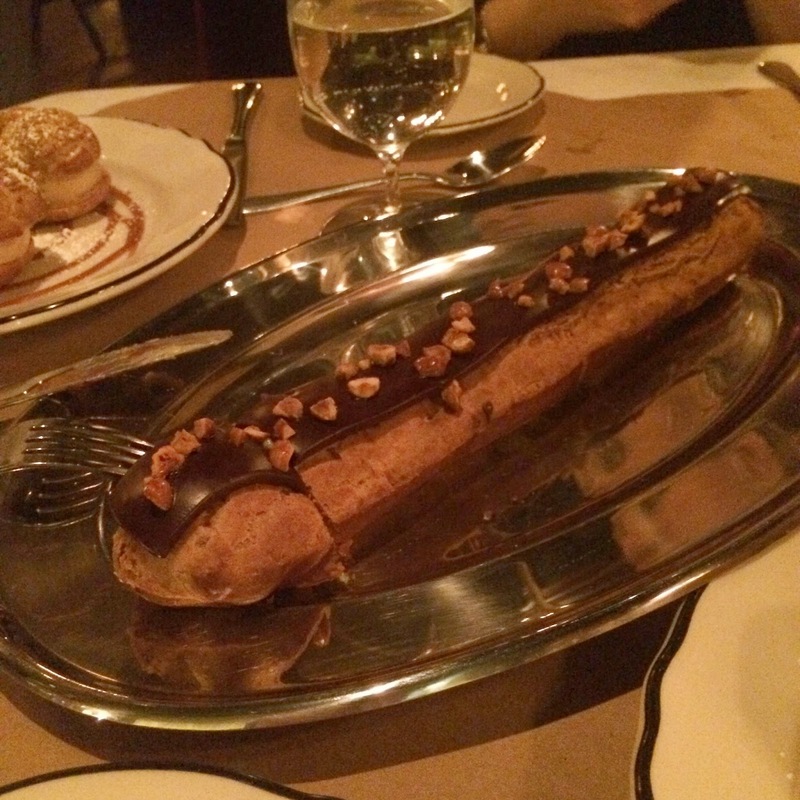 And finally-- at the urging of our Lettuce Entertain You friends-- we also ordered one of Paris Club's enormous eclairs. This was a serious dessert and not your typical bakery donut. More than a foot long, this soft pastry was filled with a delicious banana custard and was topped with fudgey icing and toasted hazelnuts. It was so big and we had so much other dessert that I ended up taking a huge slice of it home to my hubby who gladly ate it for a bedtime snack and then finished it off for breakfast the next morning. 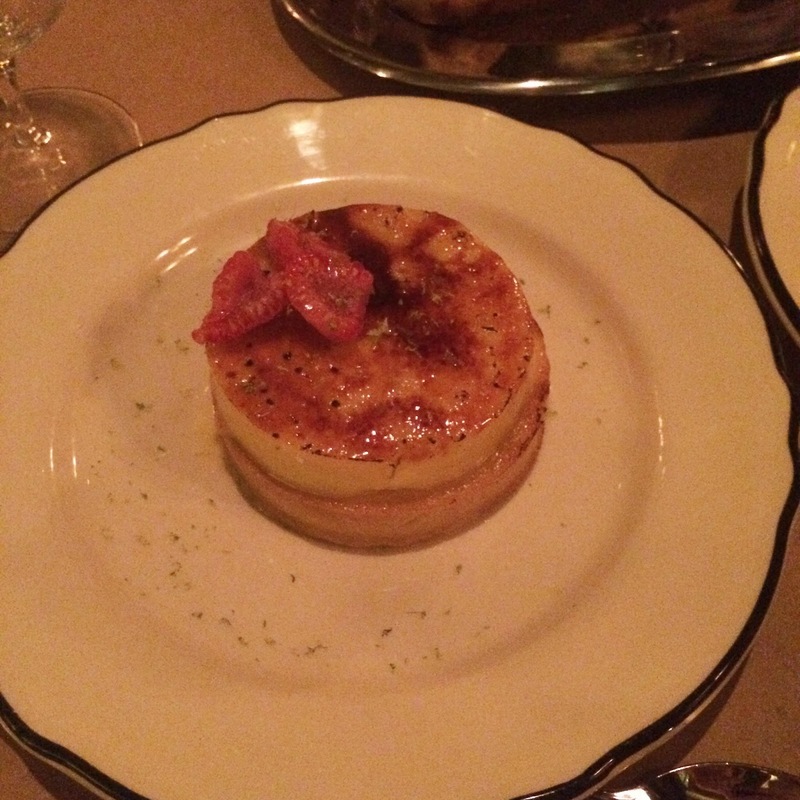 I cannot say enough wonderful things about the ambiance, experience, and food at Paris Club. It's a not-so-hidden gem in River North and should definitely be on your dining out To Do List! 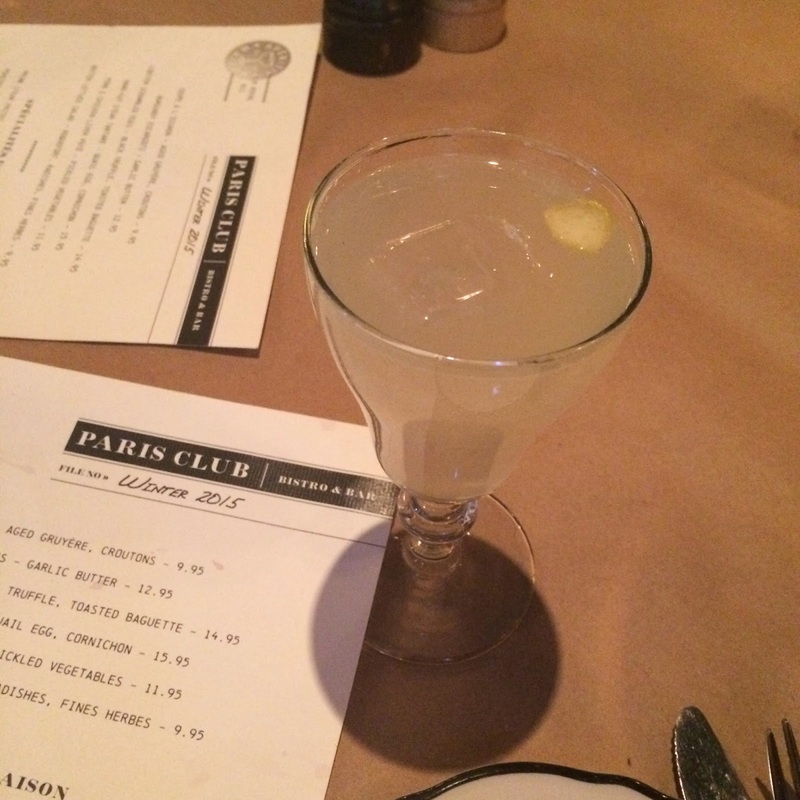 Editor's Note: While my meal at Paris Club was complimentary, the opinions expressed here-- as always-- are my own. Today is a very special day: It's my hubby Alex's birthday! In honor of my southern hubby and his special day, I'm showcasing one of his favorite foods: Barbecue! "Best BBQ" may not be the first thing that enters your mind when you're thinking about the Chicago food scene, but lately the tides are turning. Much to the delight of foodies like me, Chicago has seen several new barbecue joints pop up all over the city in the past few years. Some of them are fancy, a few are definitely dive-y. Some offer barbecue so tasty that you think you've been transported right to Kansas City or the Carolinas and others, not so much. To help you weed out the delicious from the not so much, I'm sharing a few of my favorite Chicago barbecue joints with you today-- and a few suggestions of what to order at each place too! Head to Chicago q in the Gold Coast. Chicago q is such an interesting juxtaposition: saucy barbecue and messy ribs (because let's be honest, ribs are always messy) served at tables covered in pristine white tablecloths. This is not your average BBQ joint. Chef Lee Ann Whippen elevates humble barbecue food by serving it up in a beautiful atmosphere and using high quality ingredients and housemade sauces and rubs. 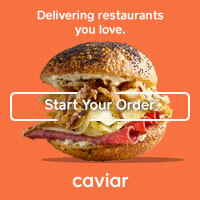 I have dined here a handful of times and have even ordered takeout once or twice and have never had a bad meal. Their pulled pork and their brisket are both wonderful and the homemade pickles and barbecue potato chips on every table are addictive. Standout menu item: The House Bacon Cheddar Hush Puppies. My husband admittedly hates anything made with cornmeal, but insists on ordering these spicy cheesy smokey hush puppies every time we eat at Chicago q. 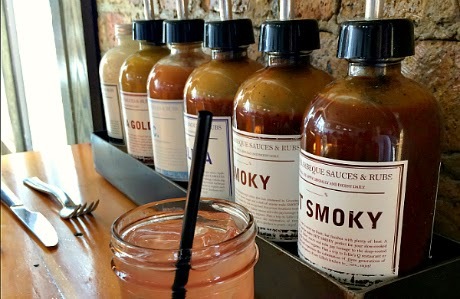 Venture up to Old Irving Park and check out Smoque. You probably wouldn't give this neighborhood barbecue shack a second look driving by, but word spread quickly about the authentic and delicious food being served up at Smoque and then Guy Fieri and the Diners, Drive Ins, and Dives crew showed up and put this little barbecue joint on the map. There are absolutely no frills at this place: you wait in line to order, take your tray to one of their first come, first served communal dining tables, and BYOB if you'd like to enjoy a cold beer with your hot barbecue. They are famous for their ribs: both St. Louis and Baby Back, but their other offerings like smoked brisket and Texas sausage are equally delicious. And if you love barbecue sides (like me! ), Smoque is the place. They offer a wide variety of sides and a few desserts (like delicious peach cobbler) in large and small sizes, perfect for sharing and sampling. Standout menu item: The Rib Combo. Because when you can't decide on one, why not get both? There is nowhere better than Twin Anchors Restaurant & Tavern in Old Town. Twin Anchors sort of epitomizes the phrase "Why change a good thing?" The restaurant is not bright and shiny or modern, but it's quaint and vintage with nautical touches that add to its charm. A scene from Batman: The Dark Knight was filmed here and the restaurant is famous for being a favorite spot for Frank Sinatra and several other celebs over the years. Twin Anchors is also famous for its saucy baby back ribs, which they've been serving up since 1932. These guys know what they're doing and you really can't go wrong with any menu item you order-- though the ribs, chicken, and pepper-jack creamed spinach would be on my 'must order' list! Standout menu item: Chicken. I know that sounds boring at a barbecue joint, but Twin Anchors slow roasts and then grills their chicken so it's juicy and full of flavor. And if that's not "BBQ" enough for you, consider the Rib & Chicken combo and get a taste of each! My 'go to' is always Lillie's Q in Wicker Park. Lillie's Q is my standby for barbecue: delicious food, tons of menu options, and a great location in the heart of Wicker Park. Definitely the trendiest of the barbecue joints on this list, Lillie's is a modern but rustic space with great people watching right on busy North Avenue and it is the perfect spot for a casual date night, dinner with friends, or a laidback lunch. Their menu offerings range from standard barbecue fare to traditional lowcountry foods like Brunswick stew and chicken and dumplings to playful takes on southern food like a chicken skin BLT and Memphis tacos. And their six handcrafted sauces are displayed at every table so no matter if you want spicy, mustardy, creamy, or vinegary, they have something for everyone. Standout menu item: A tie! For a starter, we always order the fried pickles. They are beer battered and crispy on the outside and served with a tangy ranch for dipping. For an entree, order the Tri-Tip Sandwich (delicious tender smoked beef on a brioche bun) and make it Southern Style-- they'll top it with their slaw! Try Blackwood BBQ for lunch in the Loop. It seems counter-intuitive to list a fast casual restaurant as one of the best places to get low and slow barbecue, but Blackwood makes it work. Located on Lake Street on the west side of the Loop, they're only open during business hours so it's the perfect place to pick up a hearty lunch (or breakfast!) on the go. Sandwiches and plates are available with a variety of traditional barbecue sides, but I'm a fan of their salad option for a lunch that doesn't feel so heavy: a bed of leafy greens topped with the meat and sauce of your choice and a little slaw. I was really pleasantly surprised by the quality of the food at Blackwood and have to say that the smoker aroma outside the restaurant will already have you craving barbecue no matter how early your morning commute. Standout menu item: Anything with the Chicago Style Sauce. Blackwood describes it as "the right balance of sweet and heat" and listed on a menu among more famous regional sauces like Memphis, Kansas City, and the two Carolinas, why not pay some homage to the Windy City on that pulled pork sandwich? I have said it before and I will say it again: Some of the best recipes are inspired by necessity. It's no secret that I have been traveling a lot this year (see yesterday's post for a giveaway of one of my favorite new travel accessories). Travel is fun but the more that I do it, the harder time I have getting back into my "real life" groove when I return home. During an average week, I plan out a weekly dinner menu on Saturday, grocery shop on Sunday, and then I am prepared for the week ahead and don't have to give much (or any thought) to what to make for dinner after a long day at the office. A dinner menu when I return from traveling, however, is a different story. Today's recipe was totally inspired by just that scenario: A return from travel early one morning, a quick review of the contents of my kitchen, and a dinner created completely from what I found there. The result: Really delicious BBQ chicken, apple & onion quesadillas. These quesadillas are chock full of classic flavor combinations like barbecue sauce and chicken, cheddar and apples, and caramelized onions with basically anything... and together, they work perfectly. 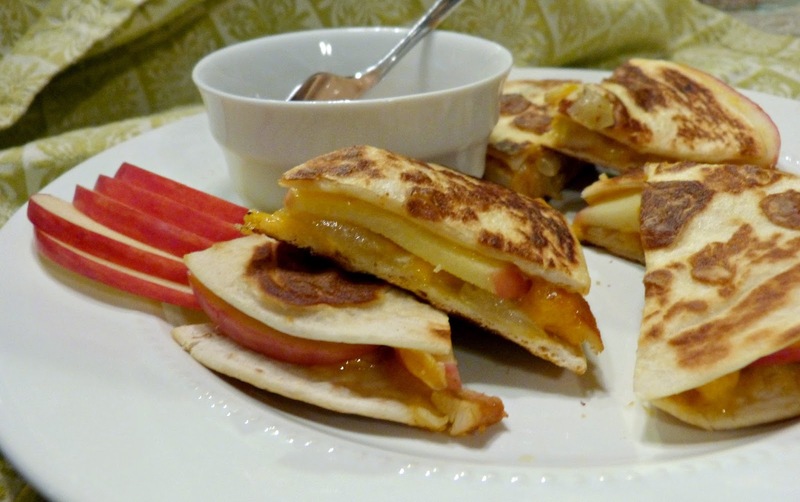 When these quesadillas are cooked, the cheese gets all melty and the apples soften slightly, and it is super delicious. I also love a good dipping sauce with my quesadillas (or really, with anything) and since I was working with the contents of my fridge, I whipped up a tasty tangy two-ingredient dip from prepared barbecue sauce and plain Greek yogurt. If you've got sour cream, you could sub that in as well-- or just serve with straight sour cream, although I like that little extra layer of bbq flavor. 1 cup barbecued chicken, cooked and thinly sliced or shredded *Get the recipe here! Heat a saute pan over medium heat and add butter. Once melted, swirl in the pan and add onions and a pinch of salt and cook, stirring often, until the onions are very soft and slightly browned, at least 15-20 minutes. Remove onions from heat and set aside. Lightly grease a baking sheet with olive oil and evenly arrange 3 tortillas on top. Sprinkle half the cheese evenly on top of each tortilla and layer evenly with chicken, apples and caramelized onions. Top with remaining cheese and place a second tortilla on top of each one. Drizzle with olive oil and bake for 12 minutes. Gently flip each quesadilla and bake for an additional 5 minutes. Remove from oven and allow to cool for 3-5 minutes or until cool enough to handle. Transfer to a cutting board and slice each quesadilla into 6 triangles. In a small bowl, whisk yogurt and barbecue sauce together until smooth and combined. Refrigerate until ready to serve. 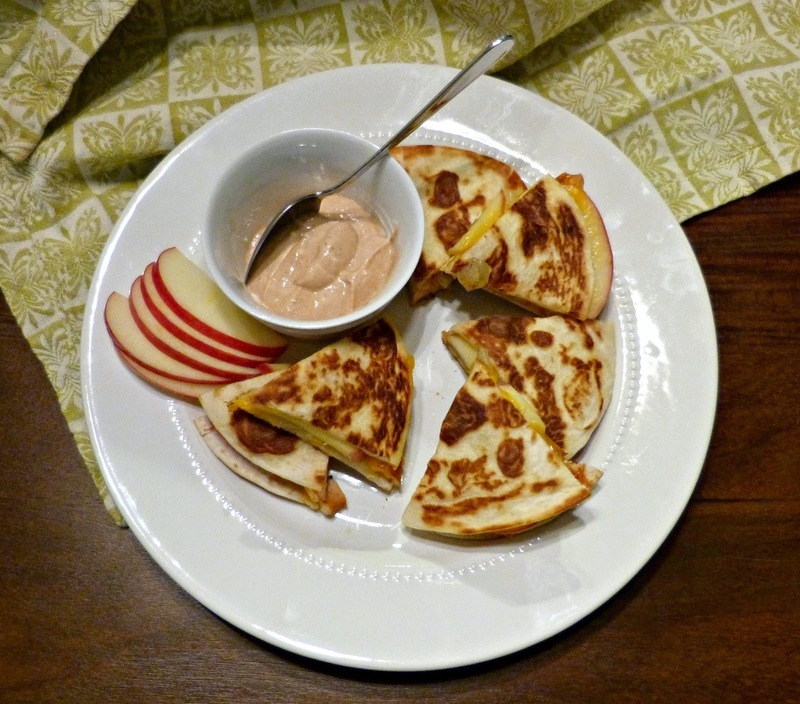 Serve quesadilla triangles warm with barbecue yogurt dip. Roadtripping with ZeroWater and a Giveaway! If you follow me on Instagram, you know that I've been traveling a LOT lately-- by plane, train, and most recently by automobile. I have a love-hate relationship with travel-- I love seeing new places, trying new restaurants, checking famous sites and experiences off of my bucket list, and racking up the airline miles and hotel points. What I don't love so much is being away from my husband and my puppy (when they're not along for the ride), disrupting my routine (I'm at my best when I stick to a regular schedule), and how incredibly difficult it can be to make healthy choices away from home. Ready to get on the road with all the work road trip essentials: driving shoes, sunglasses, and a ZeroWater tumbler, of course. And after taking a few personal trips over the past few months where I definitely overindulged, it was actually nice to be on a work trip where I was able to make my own healthier choices. That said though, healthy habits are hard to keep up on the road. So, I was really excited when ZeroWater reached out to see if I'd be interested in trying one of their water filtration tumblers-- the perfect travel accessory! Filtered water hits the road! One healthy habit I am always adamant about is drinking water. I've always got a glass of water near me at home, at the office, and at a restaurant (even sitting next to a glass of wine), but staying hydrated while traveling can be super difficult. Bottled water is expensive, it's tough to drink when you're driving, and all those plastic bottles (if not recycled, of course) can be bad for the environment too. With my ZeroWater tumbler though, I was super prepared for-- and hydrated during-- my recent trip to Indianapolis. I was able to fill it up at the office and then again at places where this water snob would normally not dare drink water from: like a rest stop fountain (yikes!) or even with water my hotel bathroom faucet. You would agree that hotel water is weird, right? And with its built-in filtration system, I can fill up anywhere and always have great tasting clean water. In a recent, independent comparative study of water filter systems, Zero Water consistently ranked at the top of each tested category and was the only filter to remove 100% of aluminum. Good Housekeeping found that ZeroWater’s filtration removes the highest percentage of the fifteen most common tap water contaminants, earning their top rating. ZeroWater is the only water filtration system to receive NSF endorsement for its reduction capabilities in chromium-6 and lead. The Water Quality Association has recognized ZeroWater for its accomplishments in delivering pure water. Not driving near much of anything: Good thing I'm not running out of good drinking water any time soon! So, if you're a frequent traveler, you're looking for a new work/gym water bottle, and/or you're a water junkie like me (or you'd like to become one), I have a fun opportunity for you today: ZeroWater is giving away one of their awesome filtration tumblers to one lucky A Squared reader! Use the Rafflecopter widget below for multiple chances to enter to win! Editor's Note: Products were provided to me at no cost in order to facilitate this post. The opinions expressed here-- as always-- are my own.